Read This Before “Going Solar”…You’ll Be Glad You Did! The use of solar power is gaining popularity in helping to offset the traditional power costs of many home and business owners. Rightfully so! Harnessing the power of the sun is a great way to reduce costs in the long-term while gaining independence from standard utility providers. If you are considering “going solar” this article is for you! We’ll help you make the most out of this emerging trend by doing one simple thing first. That is adding solar thermal water to your home prior to adding traditional photovoltaic (PV) panels that convert sunlight into electricity. WHY ADD SOLAR THERMAL FIRST? One of the first things a solar sales representative will do during your initial appointment is look at your previous 12 months of power usage. This will help them determine how many panels you’ll need to get to “net-zero”, or a home that doesn’t pull power from the traditional power grid. That’s the overall goal of anyone looking for solar solutions. The sales rep will likely give you some power saving tips like adding LED light bulbs wherever possible to help cut your power usage. What they may not tell you is to add true solar thermal water long before adding PV panels, unless they happen to sell both. True solar thermal water saves you immediately by removing of the largest single power consumption function in your home…heating water. The solar thermal evacuated tubes used for this process is 94% efficient and save significant amounts of money throughout the year. The sales representative will also review your current Heating and Cooling system this usually takes 50% of the energy of your home. If appropriate we can add a new energy efficient HVAC system with our Solar Thermal Solar Solution. These 2 steps typically remove 50% of your total energy, which is the results the RENW team has seen in 125 installations. The other payoff is these 2 steps actually cost less than adding the remaining 50% PV panels. By adding solar thermal a year in advance of adding PV panels, your overall power needs will be considerably less than a home not using this technology. A home that may have needed 20 or more panels to be net-zero, may need half as many after adding solar thermal. HOW DOES SOLAR THERMAL SAVE MONEY? First, the cost of PV panels will be reduced because you simply don’t need as many to do the same job. Remember, the job is to get to net-zero, not to fill your roof with PV panels. Comparing solar thermal evacuated tubes which are 94% efficient in heating water versus a PV panel which is typically around 17% efficient at producing electricity to heat the same water, it’s easy to see how this is a money saving proposal. Before going solar, speak to your local solar thermal contractor first. It just makes more sense to pull as much power out of your home before adding the PV panels to your roof. 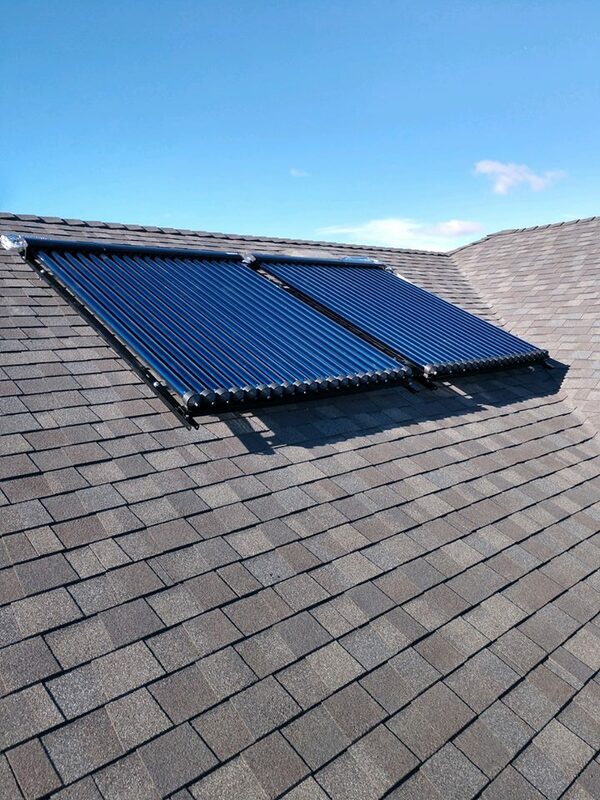 If traditional solar power contractors recommend replacing regular bulbs with LED bulbs, they should definitely recommend using solar thermal for a period before determining your true solar power needs to get to net-zero.